Today’s announcement of the Notre Dame-Wisconsin series resuming after a 56-year hiatus opens a floodgate of historical connections. The two-game series at iconic venues – Lambeau Field in 2020, Soldier Field in 2021 – promises to be one of the toughest tickets imaginable, given the geography and the enthusiasm of the two fan bases. When Notre Dame travels to play in Green Bay for the first time ever in 2020, it will complete a loop that began in that city more than a century earlier. At today’s East High stadium, a wonderful plaza pays homage to the site of the original City Stadium, where the Green Bay Packers played from 1925-1956, during which they reigned as World Champions six times. Curly Lambeau on the frozen tundra in Green Bay. Earl “Curly” Lambeau, who grew up amidst the paper mills, meat-packing plants and cheese operations on the city’s Northeast side. Curly starred at East High, and played one season of college football, alongside George Gipp on Knute Rockne’s first Notre Dame team in 1918. He returned to Green Bay, organized a team, and got his employer, the Indian Packing Co., to kick in $500 for uniforms, thus creating the Green Bay Packers. In addition to being founder and player-coach of the Packers, Lambeau was also head coach at East High. Jim Crowley, future Four Horseman, as captain of the Green Bay East Red Devils in 1920. 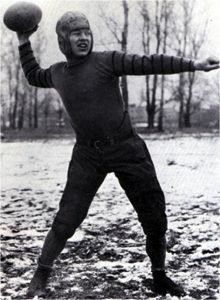 “Sleepy Jim” Crowley was one of Lambeau’s star players, helping lead the Red Devils to an undefeated 1920 season, which included a claim on the mythical state championship. Lambeau helped guide Crowley to Notre Dame, where he became one of the legendary Four Horsemen, leading the Irish to a 10-0 season and their first consensus national championship in 1924. As head coach at Fordham University in the 1940s, he coached a future Green Bay legend – Vince Lombardi. Thomas “Red” Hearden followed Crowley by two years, was a backup halfback in 1924, then a starter in ’25 and co-captain in ’26, when the Irish went 9-1, with an upset loss to Carnegie Tech the only thing keeping them from another probable national title. Hearden went on to a long coaching career back in Green Bay, for East High, St. Norbert College and the Packers. Pat O’Dea: Wisconsin and Notre Dame connections. 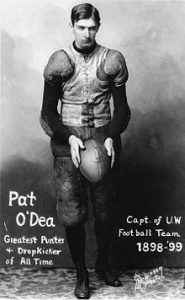 The history of Notre Dame-Wisconsin began in 1900, and centers around one of the greatest figures in 19th century football – the legendary “Kangaroo Kicker,” Pat O’Dea. An Australian rugby star, O’Dea followed his brother to the University of Wisconsin as a 24-year-old in 1896, and played for the Badgers when they won the first two Western Conference titles (7-1-1 overall in 1896, 9-1 in 1897). O’Dea, called the greatest kicker of his or any era, once drop-kicked a 62-yard field goal, and booted a 110-yard punt. He captained the Badgers in 1898 and 1899, winning All-American honors and widespread fame. It was a huge coup for Notre Dame when it hired the famous star as its head coach for the 1900 season. The 28-year-old O’Dea, fresh from graduating from Wisconsin, was able to schedule a game with his alma mater, and on Nov. 10, 1900, the Badgers smacked O’Dea and his Notre Dame squad, 54-0. O’Dea left ND after the 1901 season, but the teams met again in 1904 and 1905 in Milwaukee. After those games, UW had a 3-0 lead in the series, outscoring ND, 131-0. Notre Dame’s upset victory over Michigan in 1909 led to Fielding Yost cancelling the scheduled 1910 game and influencing his Western Conference brethren not to schedule further games with Notre Dame. That boycott was broken by Wisconsin in 1917, when the Badgers hosted Jess Harper’s last ND team, playing to a scoreless tie. Three times during the Knute Rockne era, the teams met, with huge fanfare. Rockne, Crowley, and the rest of the Four Horsemen team of 1924 (along with a good portion of the Notre Dame student body) made a trip to Madison and returned with a 38-3 victory (detailed here in Chapter 16 of Loyal Sons: The Story of The Four Horsemen and Notre Dame Football’s 1924 Champions). Rockne’s one “poor” team, the 5-4 Irish of 1928, made a return trip to Camp Randall and came up short, 22-6. 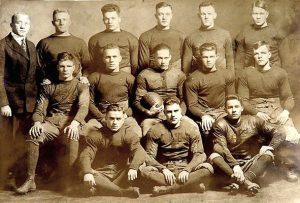 The following year, with Notre Dame Stadium being constructed and ND playing all its games away from South Bend, the Irish and Badgers met at Soldier Field (for the only time prior to 2021), Rockne’s squad emerging with a 19-0 victory en route to another national championship. An interesting backdrop to the series during those years was the close relationship between Rockne and Walter “Doc” Meanwell, Wisconsin’s basketball coach. As Rockne’s football success soared, he was in demand as a presenter on the sport at summer programs of various universities’ physical education departments. By the mid 1920s, he created the stand-alone football “coaching school” at campus sites nationwide. He then partnered with Meanwell to create the Rockne-Meanwell Coaching School, which had segments for both football and basketball coaches, as well as a program on physical training. From coast to coast, hundreds of high school, prep school, and small college coaches would gather to learn from the pair each summer. The Badgers made their first trip to Notre Dame Stadium in 1934 in a game won by the Irish, now coached by Four Horseman Elmer Layden, by a 19-0 count. Notre Dame downed UW the next two seasons under Layden, both by 27-0 scores, the latter game, in 1936 in the first year the Badgers were coached by yet another of the Horsemen, Harry Stuhldreher. Stuhldreher’s best team, the 1942 Badgers led by halfback and future athletic director Elroy “Crazy Legs” Hirsch, would win the Big 10, finish 8-1-1, and receive national champion recognition by the Helms Athletic Foundation. The Badgers opened the season with a 7-0 victory over the Camp Grant all-stars, and then hosted Frank Leahy’s Irish. The teams battled to a 7-7 tie in ND’s season opener. The Irish would finish the season at 7-2-2 with a 13-13 tie against Camp Grant in the finale. Much of Wisconsin’s talent was dispersed by military obligations the next two seasons, and Leahy’s loaded squads, ranked No. 1 in the country, handled the Badgers, 50-0 and 28-13. Ron VanrKelen led the Badgers past Notre Dame in 1962, 17-8. Another three-game series was scheduled for the early 1960s. Milt Bruhn’s 1962 Badgers, led by Green Bay native Ron VanderKelen at quarterback and Pat Richter at end, took a hard-fought 17-8 decision en route to a Big 10 title, No. 2 ranking and a classic battle with Southern Cal in the 1963 Rose Bowl. 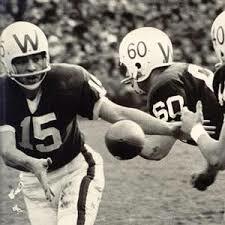 In 1963, the Badgers were ranked #6 when they came to Notre Dame Stadium and prevailed, 14-9. Those two UW wins came against Irish teams that finished 5-5 and 2-7, leading to a coaching change for the 1964 season. Notre Dame hired Ara Parseghian away from Northwestern, where Parseghian had forged a winning mark, including going 4-0 vs. the Irish. Ara Parseghian is carried off the field at Camp Randall Stadium in Madison after his first victory as ND head coach, the 1964 season opener, 31-7 over Wisconsin. The teams have not met since. On Sept. 26, 1964, in the rain at Camp Randall, the Era of Ara at Notre Dame began. With eventual Heisman Trophy winner John Huarte slinging passes all over the yard, the Irish pulled away for a 31-7 victory in front of a capacity crowd of 64,398. 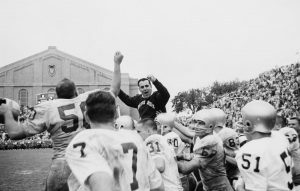 Parseghian was carried off the field by his players, in a moment that would be repeated in the next 11 years, which included two national championships. In subsequent years, annual games with Michigan State and Purdue, and eventually Michigan, along with frequent meetings with Northwestern, helped squeeze other Big Ten games from the Irish schedule. The great Notre Dame-Wisconsin series, now led by the Irish 8-6-2, was one such casualty. The most notable recent connection between the schools has been Barry Alvarez, currently the Wisconsin athletic director, who worked with Notre Dame’s Jack Swarbrick and others to schedule this two-game series. Alvarez served as defensive coordinator under Lou Holtz for the National Champion 1988 Irish. In 1990, Alvarez became Wisconsin’s head coach, and guided the Badgers to three Big 10 Championships and three Rose Bowl victories in the 1990s. In resurrecting the series, Notre Dame and Wisconsin have given us all a great opportunity to celebrate its great history. Jim Lefebvre was born and raised in Green Bay, Wis., studied journalism and covered college sports at the University of Wisconsin, and has spent the past decade chronicling the history of Notre Dame football. He is author of the award-winning books Loyal Sons: The Story of The Four Horsemen and Notre Dame Football’s 1924 Champions (2008) and Coach For A Nation: The Life and Times of Knute Rockne (2013). His two daughters, Kerry and Elizabeth, graduated with honors from Notre Dame in 2007 and 2009, respectively. Kerry also holds a Ph.D. from the University of Wisconsin.